Today I am struggling. I mean, really struggling. I am feeling tired, burned out, easily distracted, excessively hungry, overwhelmed and lost – to name just a few of the current feelings swirling in my body. I am in full cognitive realization that so many of these feelings stem from many consecutive nights of poor sleep which has only been compounded by attending a late night event this past weekend. Topped by the fact that I can tell with certainty that my monthly womanly onus is rapidly approaching. But in this moment, I am struggling. I have decided to write about these feelings today because I believe in authenticity, transparency, and honesty – and this is my truth. I am going to actively work out my feelings as I write now, and once I have posted I am going to go meditate and possibly take a nap. Because, well, I can – and self care is important. 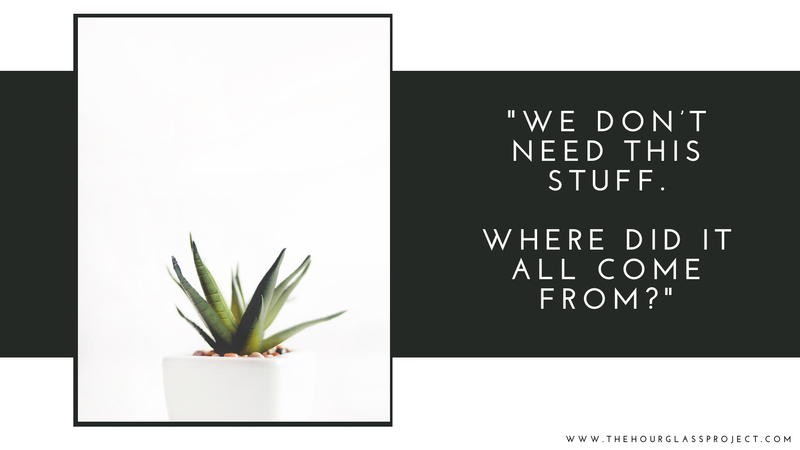 For the last few years I have been working to focus on decluttering our house, organizing what we have, and working towards a more minimalistic household. As I sit in front of my computer and write this, I look in front of me, to my right, to my left, and then behind me and I have to laugh. Minimalistic – ha. Our house is full! Full of stuff everywhere! Books, papers, workout gear, pictures, plants, dog beds, children’s toys, drawings, paintings, magazines, clothes….stuff! Everywhere – stuff. I am overwhelmed. I know. I know. First world problems. And not just first world – at the very least middle class first world problems. And as I think about this in greater detail a wave of guilt washes over me. We don’t need this stuff. Where did it all come from? Gifts, purchases, hand me downs. And the joke is that we probably have less than most average American families, but it is still way too much, and I feel like I am drowning in the pile of stuff. Yet, I have such a hard time letting go of certain things. Now, mind you, I have read Marie Kondo’s book “Spark Joy” numerous times (and tons of other books on minimalism) and have gone through the process, eliminating bags and boxes of stuff from our home. In fact, I go to Goodwill on average once a month to do a run of 1-3 boxes of things we want to donate. We keep a box in the closet at all times and as soon as something no longer sparks joy it goes in the box and off to Goodwill at the end of the month. So how is it that I am still surrounded in so much? I mean, part of it is that I am not the only one living here – and with kids, there always seems to be things entering our home. I also have a bad habit of checking out too many library books at one time! I seriously have 14 books checked out at the moment! WHAT?!? Seriously. You are probably thinking “That is ridiculous Jess!” because that is indeed what I am thinking when I admit it in writing. As a result, even though I don’t own the books I am still having to make space for them. And I certainly cannot read 14 hard copy books within a 30 day period – I mean audiobooks sure – but I am not even a speed reader! So, what am I doing to myself, other than drowning my space in books, and making myself feel bad about not finishing them? And then I have my own bookshelf of unread books! So what am I doing borrowing books? Over the past few years I have let go of boxes and boxes of books that I was holding onto and currently only have about 30 books I own. This is a huge accomplishment because I easily owned more than 5xs that amount when I started and have acquired more along the way. I LOVE books. I mean, I really love them. I love the feel and the touch. I love the raw knowledge held inside or the adventure it will take me on. But, let me admit something else. I hardly ever read! If I get 10 minutes of quiet time a day to put a tangible book in my hand, I’d say that is generous. I am trying to carve out more time to do so, but that is the truth. However, audio books? Well, that’s my jam. I can easily go through a book a day and sometimes more. The problem comes in when the book I want to read doesn’t have an audio book version – then I check it out from the library and it sits on my desk glaring at me, making me feel overwhelmed – or I hold onto copies of books I eventually want to read, that I do in fact own. 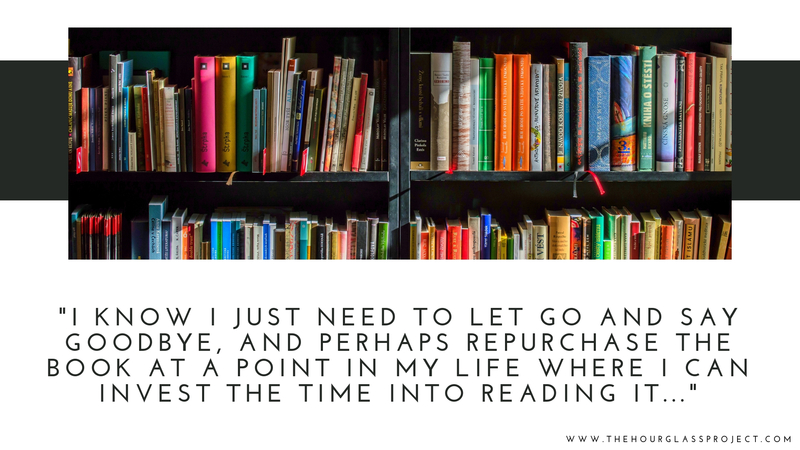 I know I just need to let go and say goodbye, and perhaps repurchase the book at a point in my life where I can invest the time into reading it, and that is probably what I will end up doing, but that won’t happen until at least a few nights of good sleep. Okay – self rant over, now onto what really broke me this morning. I have a great kids. I mean, truly fantastic, A+, amazing, loving, thoughtful, creative, brilliant kids. But, they are kids – and they are MY kids – which means that cleanliness is not something that came built into their DNA. In fact, I personally have to work daily on it, so is it fair of me to become so frustrated that they don’t have it down pat? A lot of my organizing and reorganizing is with them in mind. The question I try to answer is how can I make cleaning the easiest for them? I have created bins that they can just throw their toys into – without any rhyme or reason – just a big bin to get the toys off the floor. I spent a good majority of the day cleaning yesterday and getting rid of more stuff and making it even easier for the kids to keep their room clean, by removing their dressers and adding bins for their clothes. BUT NO. It seems that wherever they go, mess follows. 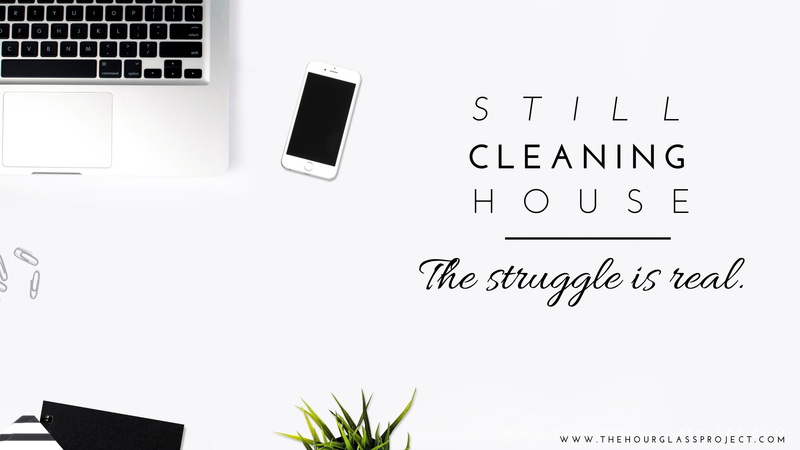 Have you ever heard the saying “Cleaning up after kids is like trying to brush your teeth while eating Oreos” or “Cleaning up after kids is like shoveling snow during a snowstorm”? YES and YES! Well, this morning I lost it. I mean, I completely lost it. Because rather than getting dressed, toys were being played with and left out, and around the house, sleeping clothes were left abandoned around the family room, and neither kid was ready to walk out the door on time. And when I brought this up, the attitude ensued and mommy lost her cool. I yelled a bit and then dropped my tone into the serious I mean business tone that the kids love so much (not!). On the walk to school I discussed my overall expectations for them, disappointment in recent behavior and attitudes, and how I need it to change immediately. I forced hugs and I love you goodbyes at the school drop off despite us all being really frustrated with each other and came home to eat my feelings – hello almond butter. 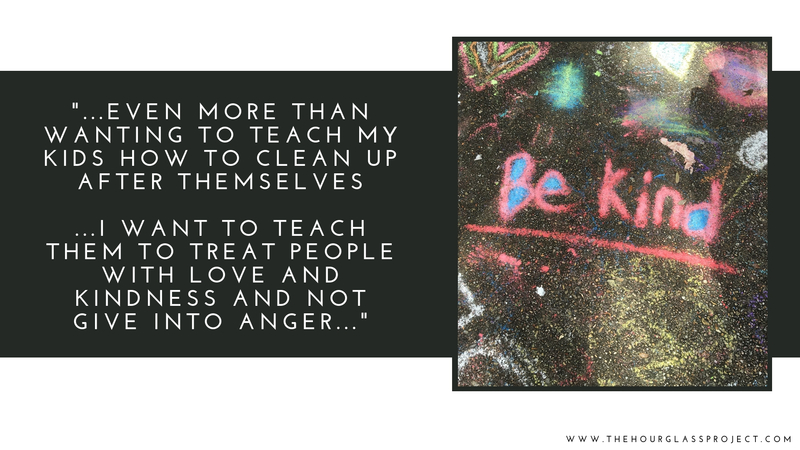 And I feel awful, because even more than wanting to teach my kids how to clean up after themselves and stay organized, I want to teach them to treat people with love and kindness and not give into anger – and today I did not lead by example. Yes, I am human and we all break down and have our moments – but there were probably many things I could have done to prevent this. On my walk home from school I called my husband in tears and we talked it out. He helped me identify several easy changes that I could make to help minimize the chance of finding myself in this position again. He pointed out that although listening to my audiobooks while making dinner and cleaning the kitchen brings joy in those events – it also disconnects me from others around and keeps me from being present. WOW – so true! I’ll be hanging up the headphones other than if I am actively running or home alone doing chores. Second, I need more sleep. And he encouraged me to take a nap. What a guy! Third, I need to lead by example. Rather than spending the time to clean up after others, I need to simply focus on cleaning up after myself. If I hang my jacket over a chair back rather than in my closet or on the coat hook, then I am in fact giving everyone permission to do so. I am far from perfect in my own behavior, I just don’t have a mom looking over me reminding me that I’m doing it wrong. Forgive myself and move on. That’s all we can do right? Move on and try not to repeat the mistake again. I am glad the kids aren’t here for the moment and that I indeed have some time to meditate and take a nap today – because I need it. But, I am also longing for them to come home from school so that we can reconnect and explore as a family the best practices that we want to tackle for keeping our home clean and inviting for all of us. I could also use a hug.